One bottle of Copic Various Ink refills a Ciao marker 13 times, a Sketch marker 8–10 times, a Copic marker 7–9 times, and a Wide marker 5–6 times. 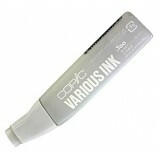 Various Ink is alcohol-based, permanent, non-toxic, photocopy-safe, dries acid-free, and cleans up with rubbing alcohol. Each bottle contains 25 cc’s of ink.